Beef cattle sold well to a top pf 224p for a 620kg Belgian Blue steer, heifers to 208 pence for a 560kg Shorthorn beef, beef cows to 189 pence for a 670kg Limousin, Friesian cows to 139 pence for 730kgs. Beef cows sold to: Broadhooks Cattle Co, Kells Limousin 670kg, £1,266 (189), T McMaster, Ballycarry Limousin 690kg, £1,283 (186), Andrew Russell, Templepatrick Limousin 520kg, £910 (175), D and H Gregg, Clough Limousin 630kg, £1,089 (173), P McCormick, Carnlough Simmental 570kg, £980 (172), T J McLornan, Nutts Corner Limousin 680kg, £1,162 (171), Raymond Andrews, Kells Saler 770kg, £1,309 (170), J and J Rea, Kilwaughter Charolais 700kg, £1,183 (169), P McKeown, Glenravel Limousin 700kg, £1,155 (165), Mervyn Crawford, Randalstown Hereford 600kg, £984 (164), Dennis Minford Limousin 700kg, £1,134 (162), D and H Gregg, Clough Aberdeen Angus 670kg, £1,078 (161), local farmer Simmental 680kg, £1,081 (159), N McKeague, Ballycastle Charolais 730kg, £1,095 (150), Robert Armstrong, Lisburn Limousin 640kg, £947 (148), Hereford 680kg, £999 (147), J A McKillop, Cushendall Limousin 500kg, £730 (146), H Gregg, Clough Aberdeen Angus 600kg, £870 (145) an N McKeague, Ballycastle Limousin 670kg, £944 (141). Friesian cows sold to: Forsythe Brothers, Loughgiel 730kg, £1,014 (139), I W and A T McCaughey, Broughshane 640kg, £889 (139), C K and R McCullough, Ballymena 580kg, £783 (135), Lyle Bryson, Dunadry 730kg, £978 (134), Forsythe Brothers, 670kg, £884 (132), J McWoodburn, Kells 660kg, £871 (132), H Millar, Antrim 520kg, £655 (126), B McAdam, Doagh 560kg, £700 (125), Joe Maybin, Kells 530kg, £614 (116), H H Reid, Glarryford 600kg, £678 (113), I W and A T McCaughey, 610kg, £671 (110), Lyle Bryson, Dunadry 730kg, £803 (110), T Adams, Rathkenny 650kg, £708 (109), W J Thompson, Glenwherry 550kg, £588 (107), W Weatherup, Carrickfergus 530kg, £567 (107) and A Hoey, Glenwherry 630kg, £661 (105). Prime heifers sold to: S R Gray, Antrim Shorthorn beef 560kg, £1,164 (208), McCready McCartney, Nutts Corner Charolais 570kg, £1,174 (206), Nevin Brown, Ballycastle Charolais 670kg, £1,373 (205), Charolais 620kg, £1,271 (205), S R Gray, Belgian Blue 530kg, £1,075 (203), C and M White, Aughfatten Shorthorn 290kg, £585 (202), S R Gray, Limousin 560kg, £1,120 (200) and J R Brown, Magherafelt Limousin 500kg, £1,000 (200). Prime steers sold to: Marie O’Kane, Upperlands Belgian Blue 620kg, £1,388 (224), S A Taggart, Ballymoney Charolais 730kg, £1,569 (215), T Mawhinney, Ballyclare Charolais 440kg, £941 (214), S A Taggart, Charolais 730kg, £1,547 (212), Gardiner Murdock, Broughshane Charolais 690kg, £1,455 (211), S A Taggart, Charolais 730kg, £1,540 (211), Nevin Brown, Ballycastle Limousin 690kg, £1,442 (209), S A Taggart, Charolais 770kg, £1,586 (206), T Mawhinney, Charolais 450kg, £918 (204), T McMaster, Ballycarry Charolais 730kg, £1,474 (202), Gardiner Murdock, Broughsane Limousin 630kg, £1,266 (201), Marie O’Kane, Upperlands Limousin 640kg, £1,280 (200), Limousin 640kg, £1,280 (200), Willian Whyte, Portglenone Limousin 540kg, £1,080 (200) and Nevin Brown, Ballycastle Limousin 620kg, £1,240 (200). Dairy stock sold to £1,380 for a calved cow from T and J Mackey, Ballyclare. Ruling prices: T and J Mackey, Ballynure £1,380, S Dunlop, Crumlin £1,350 and T and J Mackey £1,200. Suckler stock sold to £1,590 for a Limousin cow with Charolais bull calf at foot. In calf cows to £1,170. Ruling prices: Daniel F McAlonan, Dunloy Limousin heifer and bull calf £1,590, Limousin heifer and bull calf £1,560, Limousin heifer and bull calf £1,410, Limousin heifer and bull calf £1,380, J Cormican, Ballinderry Limousin heifer and heifer calf £1,280, H Nicholl, Randalstown Limousin £1,170, David McClintock, Broughshane Limousin £1,140, Daniel F McAlonan, Hereford heifer and heifer calf £1,110, J Cormican, Aberdeen Angus heifer and heifer calf £1,090 and H Nicholl, Limousin £1,080. Calves in ring three sold to £450 for a five week old Charolais bull. Ruling prices: Daniel F McAlonan, Dunloy Charolais £450, James Graham, Raloo Simmental £355, T and M E Taylor, Doagh Aberdeen Angus £355, A Dobbs, Carrickfergus Aberdeen Angus £350, James Graham, Raloo Simmental £345, J V and R J Moore, Larne Aberdeen Angus £320 and D Montgomery, Glenwherry Aberdeen Angus £310. Heifer calves sold to: D Montgomery, Glenwherry Aberdeen Angus £245, James White, Comber Simmentak £240, H Millar, Antrim Hereford £235, James Graham, Raloo Simmental £235, A McMinn, Larne Charolais £230, Charolais £215 and James White (3) Simmental £215. Friesian bulls sold to: Ian Millar, Ballymena £110, (2) £95. 200 weanlings sold to 333 pence per kg for a pair of lightweight Blonde d'Aquitaine bullocks 180kg at £600 each, heavier bullocks to 274 pence for a 350kg Limousin at £960, heifers sold to 247 pence for a 380kg Limousin at £940. Local farmer (2) Blonde d'Aquitaine 180kg, £600 (333), David Robinson, Crumlin Limousin 210kg, £600 (285), local farmer (2) Blonde d'Aquitaine 210kg, £600 (285), W and M Orr, Ballycastle Charolais 280kg, £785 (280), J and D Colgan, Ballycastle (2) Blonde d'Aquitaine 240kg, £670 (279), W and M Orr, Charolais 300kg, £825 (275), J and D Colgan, Limousin 290kg, £785 (270), local farmer Blonde d'Aquitaine 240kg, £645 (268), P McCormick, Carnlough Limousin 300kg, £805 (268), L McKeever, Ballymoney Limousin 220kg, £590 (268), J and D Colgan, Charolais 270kg, £720 (266) and L Hamill, Templepatrick (2) Aberdeen Angus 280kg, £740 (264). A Murray, Cushendall Limousin 350kg, £960 (274), A Dobbs, Carrick Aberdeen Angus 340kg, £910 (267), W and M Orr, Ballycastle Simmental 320kg, £850 (265), W and M Orr (2) Limousin 310kg, £810 (264), G McMaster, Broughshane Charolais 340kg, £890 (261), A Dobbs, Carrickfergus (2) Limousin 340kg, £880 (258), John Beggs, Whitehead Limousin 320kg, £825 (257), S Taylor, Ligoniel Charolais 340kg, £860 (252), A S Millar, Antrim Charolais 350kg, £840 (240), Charolais 330kg, £775 (234), C Millar, Kilrea Limousin 340kg, £750 (220), L McKeever, Ballymoney Limousin 310kg, £660 (212). A S Millar, Antrim Charolais 370kg, £960 (259), W J and R J Cuthbert, Ballycarry Blonde d'Aquitaine 390kg, £995 (255), A Dobbs, Carrickfergus (2) Limousin 380kg, £945 (248), John Gribben, Randalstown (2) Limousin 390kg, £950 (243), W J and J Cuthbert, Blonde d'Aquitaine 460kg, £1,115 (242), K Woodside, Islandmagee Limousin 400kg, £955 (238), C Millar, Kilrea (2) Aberdeen Angus 370kg, £875 (236), A Murray, Cushendall Limousin 410kg, £950 (231), A Thompson, Ballyclare (3) Limousin 380kg, £880 (231), A Dobbs, Carrickfergus Limousin 400kg, £900 (225) and John Gribben, Randalstown Limousin 420kg, £940 (223). W J and R J Cuthbert, Ballycarry (3) Blonde d'Aquitaine 280kg, £700 (250), Ivan Wallace, Doagh Limousin 220kg, £540 (245), T McKillop, Glenarm Limousin 300kg, £735 (245), W J and R J Cuthbert, Ballycarry (3) Blonde d'Aquitaine 290kg, £705 (243), John Beggs, Whitehead Limousin 240kg, £580 (241), George Quinn, Upper Ballinderry (2) Limousin 300kg, £700 (233), T McKillop, Glenarm Limousin 290kg, £660 (227), J and D Colgan, Ballycastle Charolais 280kg, £635 (226), George Quinn, Upper Ballinderry (3) Limousin 270kg, £610 (225). W J and R J Cuthbert, Ballycarry (3) Blonde d'Aquitaine 330kg, £770 (233), A McIlveen, Kells (2) Limousin 340kg, £765 (225), George Quinn, Upper Ballinderry (3) Limousin 330kg, £740 (224), (2) Limousin 320kg, £700 (218), S Taylor, Ligoniel Charolais 310kg, £675 (217), George Quinn, (3) Limousin 330kg, £715 (216), S Taylor Charolais 310kg, £670 (216) and local farmer Limousin 330kg, £710 (215). Ian Davidson, Larne Limousin 380kg, £940 (247), W J Cuthbert, Ballycarry Blonde d'Aquitaine 360kg, £820 (227), Ian Davidson, Limousin 380kg, £865 (227), W J and J Cuthbert, (2) Blonde d'Aquitaine 400kg, £905 (226), K Woodside, Islandmagee Limousin 480kg, £1,040 (216) and W J and R J Cuthbert, (3) Blonde d'Aquitaine 370kg, £770 (208). A good entry of ewes and lambs were presented at the final Monday evening sale of the season, selling to a top of £210. Leading prices as follows: Dougie Hill, Ballynure 1 Texel ewe and 2 lambs £210, Neil and Pamela Park, Antrim 8 Texel ewes and 14 lambs £200, local farmer 9 Crossbred ewes and 14 lambs £200, Peter Baird, Carrickfergus 5 Texel ewes and 8 lambs £198, Lynsey Topping, Islandmagee 2 Texel ewes and 14 lambs £195, Neil and Pamela Park, 1 Texel ewe and 2 lambs £195, Gareth Scroggie, Armagh 1 Mule ewe and 2 lambs £192, L McAuley, Glenarm 3 Texel ewes and 4 lambs £190, Bryan Gardiner, Ballymena 4 Texel ewes and 6 lambs £188, Kim Steele Nicholson, Antrim 4 Suffolk ewes and 14 lambs £185, S McElwee, Desertmartin 7 BDM ewes and 14 lambs £182, 5 Texel ewes and 10 lambs £182, I Montgomery, Glenwherry 3 Suffolk ewes and 3 lambs £180, 5 Crossbred ewes and 5 lambs £175, 4 Crossbred ewes and 4 lambs £172. 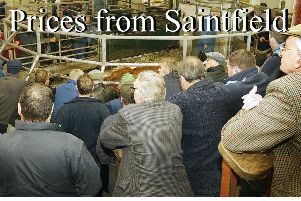 An entry of 140 store cattle in Ballymena on Tuesday resulted in a terrific trade. Bullocks sold to £720 over for a Limousin 630kg at £1,350 offered by A McDonald, Portglenone. Heifers sold to £680 over for a Limousin 500kg at £1,180 presented by J and S Bailey, Ballycastle. W and P McCallion, Portglenone Limousin 330kg, £820 (248), B Richmond, Cloughmills Aberdeen Angus 470kg, £1,140 (242), W and P McCallion, Limousin 400kg, £945 (236), F McNeilly, Glarryford Limousin 410kg, £960 (234), D Knox, Coleraine Limousin 360kg, £835 (231), W and P McCallion, Limousin 350kg, £810 (231), D Patterson, Crumlin Charolais 450kg, £1,030 (228), W and P McCallion, Limousin 450kg, £1,025 (227), Limousin 420kg, £955 (227), R McNabney, Broughshane Speckle Park 390kg, £875 (224), Limousin 440kg, £985 (223), D Patterson, Crumlin Charolais 470kg, £1,050 (223), D Knox, Coleraine Limousin 390kg, £870 (223), W Montgomery, Broughshane Belgian Blue 450kg, £990 (220), B Richmond, Cloughmills Hereford 490kg, £1,070 (218) and R McNabney, Limousin 390kg, £825 (211). F McNeilly, Glarryford Limousin 510kg, £1,165 (228), B Richmond, Cloughmills Belgian Blue 520kg, £1,180 (226), G D Graham, Kells Charolais 510kg, £1,145 (224), B Richmond, Charolais 590kg, £1,290 (218), F McNeilly, Lim 520kg, £1,130 (217), A McDonald, Portglenone Limousin 630kg, £1,350 (214), Charolais 520kg, £1,080 (207), K Woodside, Islandmagee Limousin 650kg, £1,290 (198), C Crawford, Clough Hereford 530kg, £1,040 (196), Mervyn Rea, Nutts Corner Aberdeen Angus 610kg, £1,175 (192), S Darragh, Toomebridge Limousin 650kg, £1,250 (192), C Crawford, Clough Hereford 570kg, £1,090 (191), Belgian Blue 540kg, £1,030 (190), G D Graham, Kells Stabiliser 620kg, £1,170 (188), K Woodside, Islandmagee Limousin 670kg, £1,230 (183) and G D Graham, Stabiliser 650kg, £1,180 (181). S Wilson, Ballynure Belgian Blue 490kg, £1,160 (236), J and S Bailey, Ballycastle Limousin 500kg, £1,180 (236), Limousin 460kg, £1,080 (234), W and P McCallion, Portglenone Limousin 500kg, £1,170 (234), Limousin 470kg, £1,070 (227), S Wilson, Limousin 480kg, £1,090 (227), Limousin 480kg, £1,080 (225), A McDonald, Portglenone Limousin 450kg, £1,010 (224), J McClure, Ballymoney (2) Charolais 500kg, £1,105 (221), W and P McCallion, Limousin 400kg, £880 (220), J and S Bailey, Limousin 430kg, £930 (216), C Crawford, Clough Belgian Blue 460kg, £990 (215), Colin McKee, Broughshane Limousin 390kg, £810 (207), J McClure, Ballymoney Aberdeen Angus 440kg, £905 (205), Ivan Cherry, Ballymena Charolais 460kg, £940 (204). S Wilson, Ballynure Limousin 510kg, £1,170 (229), Limousin 510kg, £1,140 (223), J McClure, Ballymoney Aberdeen Angus 520kg, £1,145 (220), W and P McCallion, Portglenone Limousin 520kg, £1,085 (208), C Crawford, Clough Belgian Blue 530kg, £1,095 (206), Ivan Cherry, Ballymena Charolais 580kg, £1,175 (202), J McClure, Ballymoney Belgian Blue 570kg, £1,150 (201), K Woodside, Islandmagee Limousin 510kg, £1,015 (199), C Crawford, Clough Belgian Blue 510kg, £985 (193), K Woodside, Limousin 580kg, £1,105 (190), Limousin 570kg, £1,060 (186) and Mervyn Rea, Nutts Corner Hereford 520kg, £900 (173). An entry of 620 sheep in Ballymena on Wednesday resulted in an easier trade. Lambs sold to 561p for a pen of Texels 21kg at £118 from David Warwick, Moorfields and to a top per head of £128 for 4 Texels from A Gault, Newtownabbey. Fat ewes sold to £128. Top prices per kg: David Warwick, Moorfields 3 Texel 21kg, £118 (561), Gordon Francey, Ballymena 2 Suffolk 21.5kg, £117.50 (546), James Bellingham, Ballymoney 6 Texel 20.5kg, £110 (536), J McNeill, Coleraine 10 Texel 20kg, £107 (535), A l Gault, Newtownabbey 4 Texel 24kg, £128 (533), T Robinson, Ballynure 3 Texel 22.5kg, £120 (533), E Clyde, Muckamore 9 Texel 20.5kg, £109 (531), A and D McAfee, Bushmills 10 Texel 21.5kg, £114 (530), J Walker, Randalstown 6 Texel 20.5kg, £108 (526), S Jamieson, Broughshane 20 Texel 22kg, £114 (518), N and J McKee, Cairncastle 12 Texel 21kg, £108 (514), J Lynn, Cullybackey 10 Texel 21.5kg, £110 (511), D S and D McKay, Rathkenny 17 Texel 21.5kg, £110 (511), Houston Crooks, Kilwaughter 11 Charollais 21.5kg, £110 (511), William Houston, Moorfields 6 Texel 21.5kg, £110 (511) and J Murray, Ballymoney 7 Texel 22.5kg, £115 (511). Top prices per head: A l Gault, Newtownabbey 4 Texel 24kg, £128, 2 Suffolk 29.5kg, £127, Robin Nicholson, Monkstown 2 Texel 29.5kg, £126, Eoin Butler, Rathkenny 1 Suffolk 32kg, £125, A Moore, Portglenone 2 Charollais 30kg, £125, Robin Nicholson 8 Texel 24.5kg, £122, J and J Rea, Kilwaughter 8 Texel 23.5kg, £120, T Robinson, Ballynure 3 Texel 22.5kg, £120, Nigel McClure, Ballymoney 1 Texel 24kg, £118, David Warwick, Moorfields 3 Texel 21kg, £118, M Wallace, Dunloy 19 Texel 23kg, £117.50, Gordon Francey, Ballymena 2 Suffolk 21.5kg, £117.50, P J McKinley, Martinstown 2 Texel 23.5kg, £117, M Park, Ballymena 12 Texel 23kg, £117, R and J Wylie, Clough 15 Suffolk 23kg, £117, Danny Duffin, Toomebridge 8 Charollais 23.5kg, £117.